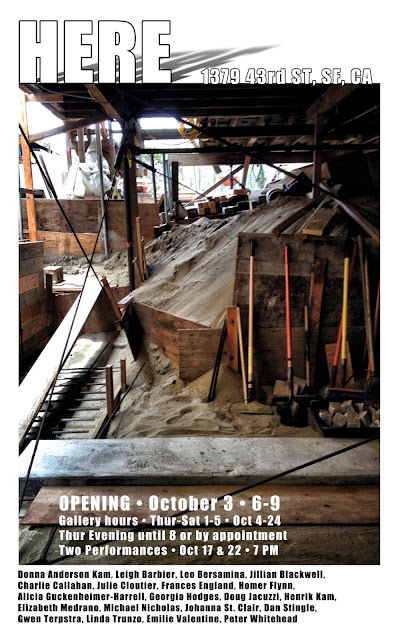 Here is an exhibition featuring 20 Bay Area artists celebrating place and process in an unconventional setting. Friday, October 2 – Sunday, October 24th. Artists: Donna Anderson Kam, Leigh Barbier, Leo Bersamina, Milan Blackwell, Charlie Callahan, Julie Cloutier, Frances England, Homer Flynn, Alicia Guckenheimer-Harrell, Georgia Hodges, Doug Jacuzzi, Henrik Kam, Elizabeth Medrano, Michael Nicholas, Johanna St. Clair, Dan Stingle, Gwen Terpstra, Linda Trunzo, Emilie Valentine, Peter Whitehead. Comment by AB: You wouldn't think a place like this could still exist in San Francisco-- a completely bombed-out house, the facade looking like something out of a grade B horror film. But it's really kinda kicky inside, existing for the time being as some kind of an "art compound" complete with chickens in the backyard. The atmosphere is warm and convivial with artistic oddities on display everywhere.